The George Municipality’s new recyclables refuse removal contract will address the bigger picture of waste reduction and recycling, and entails more than just distribution and collection of blue bags. GEORGE NEWS - After a frustrating 8 months without a recycling contractor, George Municipal Manager Trevor Botha confirmed the appointment of Greens Scrap Recycling, operating as Interwaste, from this Friday (1 February). “After frustrating delays that were not entirely in our control, we are relieved to finally have made an appointment," says Botha. "The municipality remains committed to waste reduction and recycling, and believes that its efforts will not only regain momentum but exceed current waste reduction figures." The George Municipality introduced a two-bag refuse collection system in 2008, distributing and collecting blue bags for recycling in addition to black refuse bags. The service was temporarily hampered at the end of the previous contract on 31 May 2018. Blue bags could no longer be provided and the municipality had to temporarily incorporate the collection of recyclables into its normal refuse collection schedule, and separate at the municipality’s waste transfer station. The tender process commenced in the new 2018/19 financial year and experienced several unforeseen delays, before eventual appointment last week. Botha said the municipality wanted the new contract to address the bigger picture of waste reduction. The contract kicks off with the delivery of two green bags and two blue bags to households on their normal refuse removal days next week (4 -8 February 2019). Collection of green and blue bags will start on Monday 11 February 2019 and will be collected in neighbourhoods on the same day as the black bag refuse removal. Municipal trucks will collect the black bags, while blue and green bags will be collected by Interwaste in different trucks on the same day – before or after the black bag collection, and can be hours apart. Every week on the same day as collection, Interwaste will replace each collected full bag, blue or green, with another of the same colour at the same time as they collect the full bag. In addition, Interwaste will drop off two green bags and two blue bags to non-participating households every quarter to encourage them to participate in waste reduction efforts. Phase One involves distribution to and collection from the nearly 17 000 households in 48 neighbourhoods in the municipal area that has a history of recycling. These include most suburbs of George as well as the outer areas of Wilderness, Kleinkrantz, Hoekwil, Victoria Bay, Herolds Bay, Delville Park, Harlem and Uniondale. Phase Two will commence following an extensive awareness campaign of at least six months in areas that are currently not recycling. These include nearly 21 000 households in Ballotsview, Borcherds, Conville, Lawaaikamp, New Dawn Park, Pacaltsdorp, Parkdene, Protea Park, Rosemore, Sea View and Thembalethu. Roll out of Phase Two will be announced well in advance. Households can put out seven bags per week, in any combination of green, blue and black. Additional tied bundles of branches are allowed if they are shorter than a metre in length and can be picked up by one person. 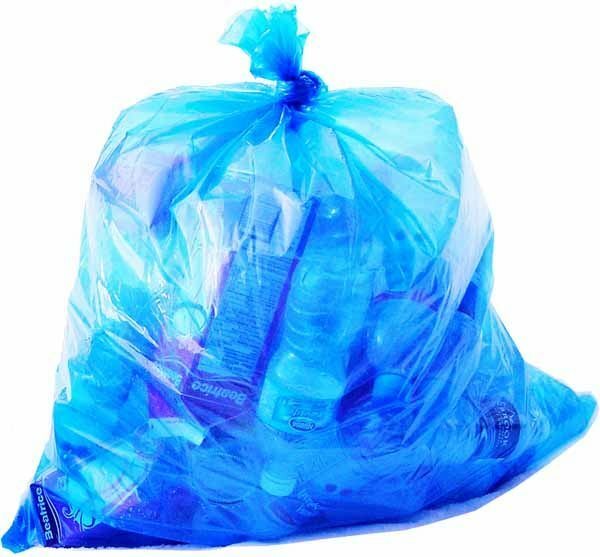 Blue bags are for all non-soiled recyclable materials, including plastic, paper, card board, glass etc. Green bags are for green waste, including organic kitchen waste such as fruit and vegetable peels, as well as garden waste, including grass cuttings, leaves etc. No soil is allowed in the green bags. Black bags are for ‘wet’ waste, things that cannot be recycled. Households or businesses that are actively recycling and require additional green or blue bags, can collect from the Interwaste premises at 10 Extension Road, Pacaltsdorp Industrial Area. All refuse bags must be put out by 07:00 on removal day. Please don’t put bags out the day or night before removal. Please wrap broken glass in newspaper before placing in bags to prevent injuries to workers. A pack of 26 black bags is distributed to households quarterly.